Terracom Systems: Should I Install a Home Theater System? Should I Install a Home Theater System? If you've ever seen a movie or the big game on a friend's custom home theater system then you've probably asked yourself the question, "Should I Install a Home Theater System?" While big screen TVs and high-end speakers provide great home entertainment, there is nothing quite like the experience of watching a movie or game in a professionally installed custom home theater system. When designed and installed correctly, a home theater system is the perfect culmination of sight and sound. Everything from the HD projector, projector screen, surround sound system, seating, acoustics, lighting, and other theater elements work together harmoniously to create an unbeatable entertainment experience. It's not just about buying the most expensive components available and then wiring them together. A successful home theater installation requires the right components, seating, the right layout for the room, the right fabric on the walls, the right lighting, and great craftsmanship. How Much Does a Custom Home Theater System Cost? Cost is probably the biggest consideration when deciding whether to install a home theater system or which installation company to hire for that matter. At the end of it all, you shouldn't have to declare bankruptcy because you spent too much. You need to decide from the beginning what you can and can't afford and then decide what you're willing to pay. The most expensive option doesn't always guarantee the best products and service and the cheapest option isn't always the best deal. 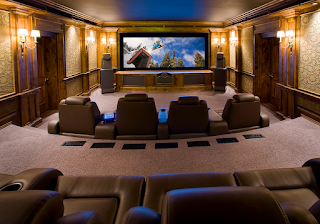 How Long Does it Take to Install a Custom Home Theater System? Every home theater system is different. Some theater systems are very basic while others will completely transform that part of your home. The point is, like most home improvements and renovations, it could take a few weeks to a few months depending on the depth of the project. Should I Install a Home Theater System on My Own? Maybe. If you're a retired electrician with all the time in the world to devote to the project and you just happen to love carpentry, wiring, lighting and you understand the complex world of acoustic design - then sure. If not, you might be in over your head. Terracom Systems has a team of home theater experts who know all about the intricacies that go into making a quality home theater system. Our professional installers have the knowledge, time, equipment and patience required to do it right. What Are the Benefits of a Custom Home Theater System? It all comes down to quality. The lighting, the sound, the imagery, the seating and just about everything else in the room has been selected, positioned, integrated and fine-tuned to provide the best audio video experience possible. If you can budget the money needed for the installation, if you enjoy high quality home entertainment, and you don't mind a team of professional and polite home theater installers working in your home to complete the project, then YES... you should install a home theater system in your home.